Meatballs. Giant bacon-wrapped meatballs. The Key Ingredient Recipe tablet suggested this fantastic idea to me when I searched for a meatball recipe. It's a good thing the meatballs were tasty, because that's about the only thing this tablet gets right. It's a great idea: a dedicated tablet in the kitchen, in a cooking-proof case, with a custom-built app to find and store recipes from across the internet and read them to you while you cook. Brilliant! Execution? Not so much. The hardware would have been scraping the bottom of the barrel years ago. The actual tablet is a Supersonic sc-2307BT, which can be had on Amazon for $89, $10 more than Amazon is currently selling the Key Ingredient tablet for. While it's impressively running Android 4.4.4, the 1GHz dual-core processor can barely keep up with page scrolling in Chrome. The tiny 7-inch TFT LCD has terrible viewing angles and a lackluster resolution of just 800x480. The poor viewing angles made it hard to read as I move about the kitchen, and the screen's too small to read while it's down on the counter. With just 4GB of internal storage, it's a good thing the recipes are mostly online. Poor off-axis viewing angles made the recipes difficult to read as I moved around getting ingredients together. Key Ingredient also touts the endless entertainment possibilities of the tablet, and it can play music or videos for you while you cook. YouTube playback was smooth, and since it comes with the Google Play store, you can add Netflix, Hulu, Spotify, or any other entertainment app you'd like. The problem is, you'll never hear the sound, which even at max volume, is not nearly loud enough to be heard over running water, let alone sizzling bacon. And that heat-resistant silicone case it comes with? 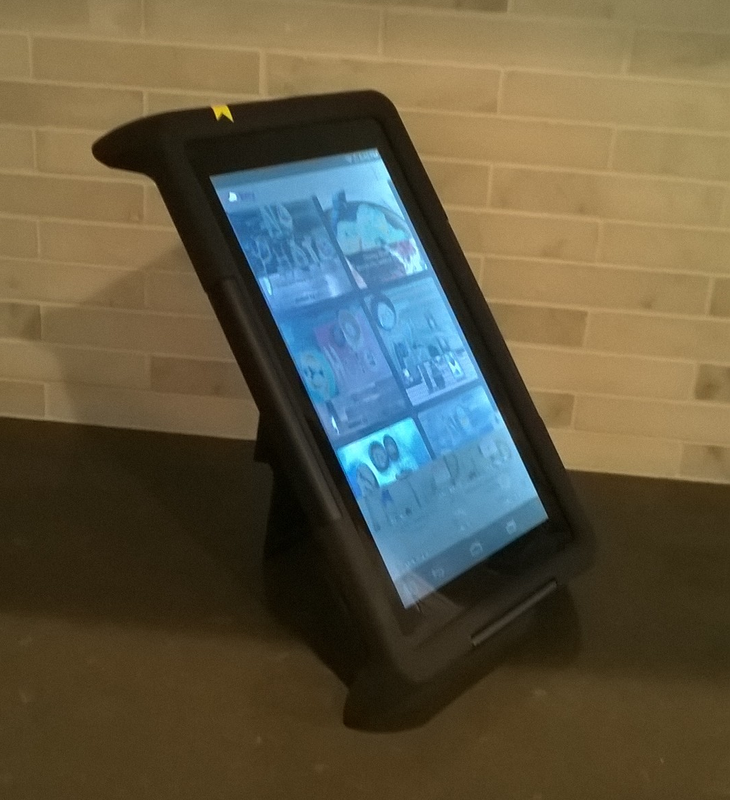 It props the tablet up at what would be a good angle if there were such a thing as a good angle with this screen, and it comes off if you'd like to use the tablet alone with less bullk, but there is no screen protection. 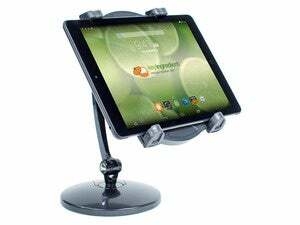 So it only protects against splashes and spills if you only spill things on the sides or back of the tablet. 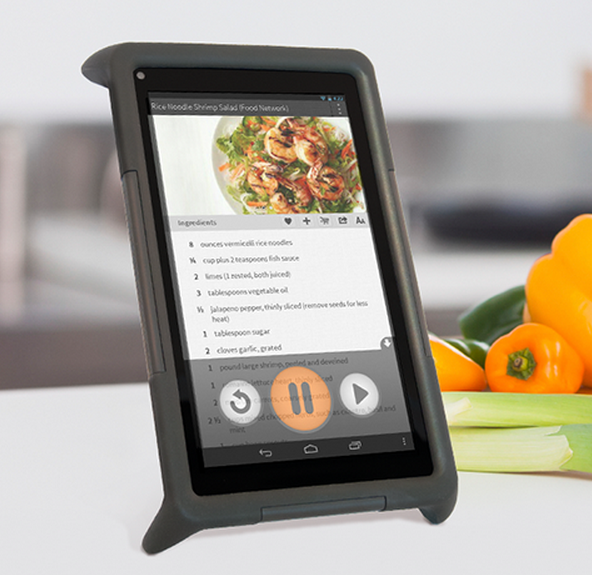 Text-to-speech is another highly touted feature: The tablet will read your recipe to you as you go. Here again, another nice idea in theory that doesn't really hold up in practice. It does pause between steps, but not nearly long enough to complete a step, and there is no hands-free way to tell it to pause or advance. You must touch the screen with your grubby cooking fingers. The Key Ingredient tablet is basically a portal to the website of the same name. While the tablet holds 200 recipes in storage for offline access, the real meat and potatoes (see what I did there?) 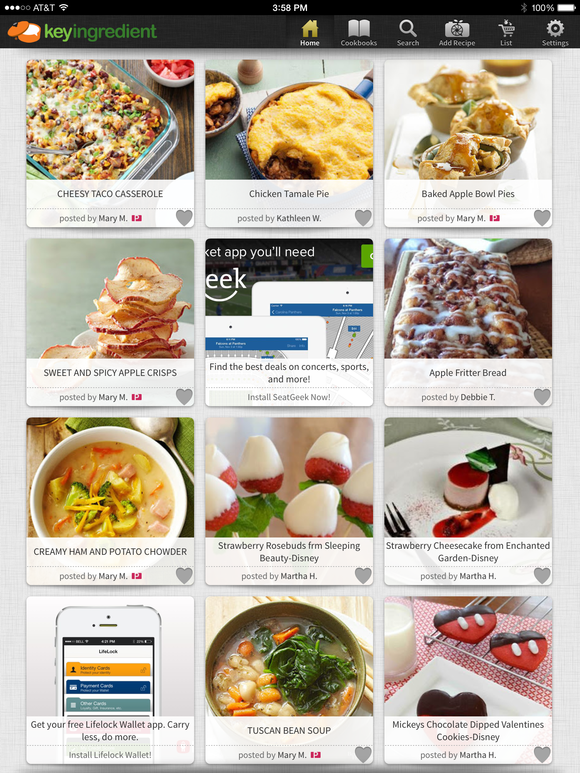 is in the two million user-submitted recipes available online. The recipes look great...on an iPad. 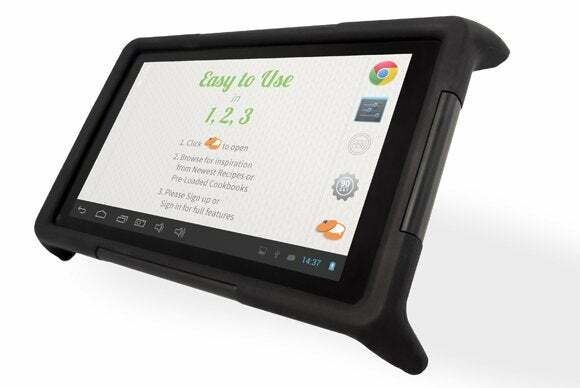 Text to speech is really the only thing this tablet has to offer, as the same key ingredient app, with access to all two million online recipes (but no text to speech) is available as a stand alone app for iOS and Android. The app itself is really good and makes a fantastic resource for the kitchen, but you'd be much better off running the app on whatever old tablet you happen to have laying around. My third-generation iPad with Retina display does a much better job than Key Ingredient's dedicated hardware. Key Ingredient's Recipe Tablet serves as a portal to the company's recipe-sharing website, but you'd be better off re-purposing an older tablet and just using the Key Ingredient app.